Mayor Of Paris Announces Plans To Temporarily House Migrants : The Two-Way The proposed migrant camp would be located in the north of France's capital city, where hundreds of migrants are already camping informally. 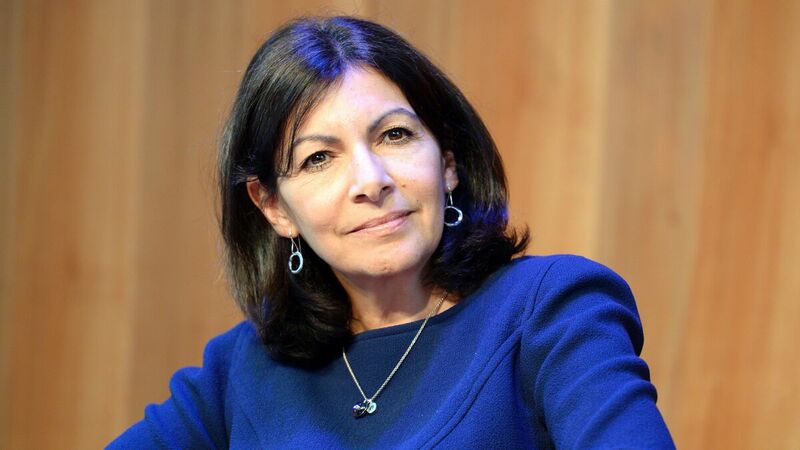 Paris Mayor Anne Hidalgo attends a news conference in Paris on Monday. The mayor of Paris announced Tuesday that she plans to build a camp for migrants and refugees in the north of France's capital. Mayor Anne Hidalgo said the camp's exact location would be determined in the next few days and that the facility would be set up within the next six weeks, the BBC reports. "Paris will not stand by and do nothing as the Mediterranean becomes a graveyard of refugees," Hidalgo said at a news conference, according to The Guardian. U.N. officials fear hundreds of migrants may have died in shipwrecks in the Mediterranean over the past week alone. The BBC notes that hundreds of migrants are already staying in and around the northern part of Paris, in makeshift camps. Many say they are en route to other countries in Europe and do not plan to stay in France. The Associated Press reports that Hidalgo has previously sparked controversy in Paris with a plan to open a homeless shelter near a "chic neighborhood." "The Socialist mayor said several times she hopes the state will be a 'partner' in the project, which she said must conform to international norms for refugees. "She said Parisians have a humane duty to help the have-not travelers, adding that she's confident 'the Paris population will be at our side.' "